In William DeBuys recent book, “A Great Aridness”, he discusses biological diversity at El Uno Ecological Reserve, located within the Greater Janos Grasslands, in Chihuahua, Mexico. 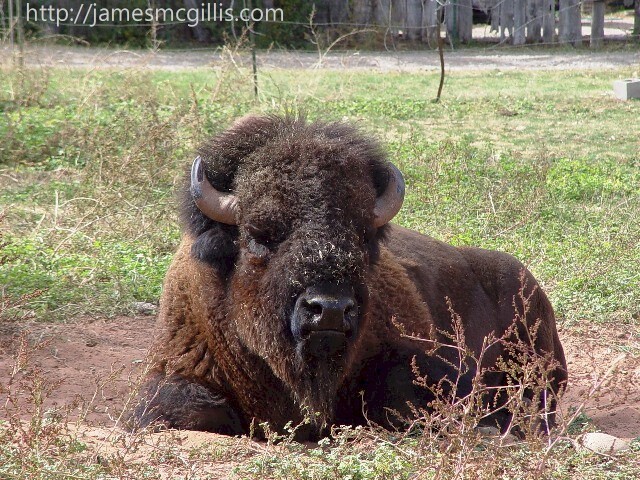 Although his primary focus is on scrubland encroachment and related stress on black-tailed prairie dog populations, he also touches upon the American Bison herd now located there. In 2009, twenty-three bison from Wind Cave National Park, South Dakota arrived at Janos to start a breeding herd within northern Mexico. Unlike ninety-five percent of the bison in North America, the Wind Cave bison herd is genetically pure, containing no cattle genes. 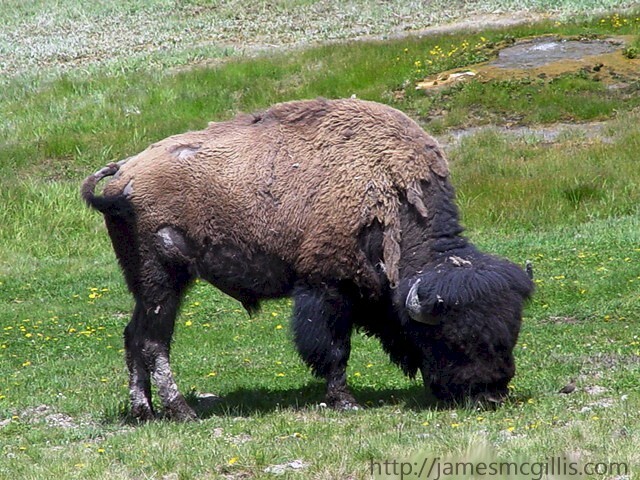 Unlike cattle, which stay and feed to the root, bison eat and roam, leaving some of the plant intact. Their heavy step breaks up the soil and helps grass seeds grow. In 2009, National Park Traveler, Bob Janiskee wrote, “The trans-border herd referenced here lives north of the Janos grasslands and migrates seasonally into Hidalgo County, New Mexico. 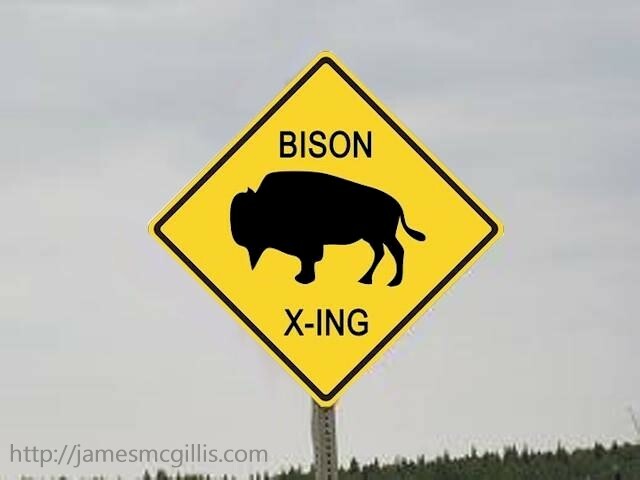 This is actually a bit of a problem, since the wild bison is a protected animal in Mexico, where it is considered endangered. It is not protected in the U.S., where it is seen as a grazer, competing with livestock”. On May 11, 2011, the Nature Conservancy staff at El Uno Ecological Reserve rejoiced with the birth of a female bison calf. It was the first calf conceived locally since 2009, when the Conservancy and a Mexican national working group initiated the Bison Reintroduction Project. From Canada to Mexico, grasslands are relatively similar. There are only a few differences, such as the temperature in summer, the amount of snow in winter, and their native vegetation. That is why the bison herd in El Uno, coming from South Dakota has been able to adapt well to the grasslands at the Janos Biosphere Reserve. According to the U.S. National Library of Medicine, “Archeological records and historical accounts from Mexico document that the historic range of the bison included northern Mexico and parts of Southern New Mexico. 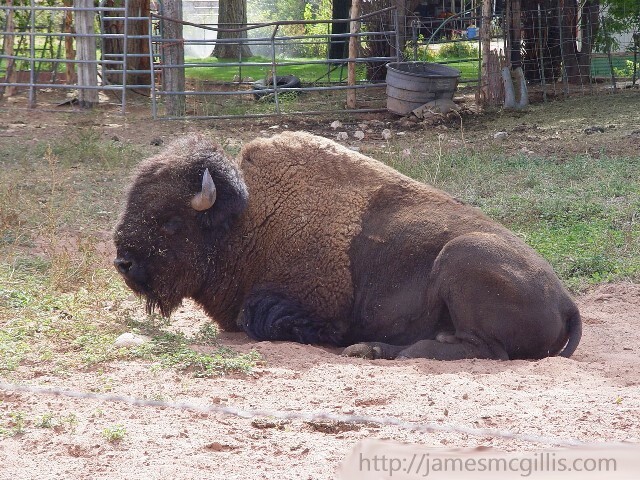 The Janos-Hidalgo bison herd, one of the few free-ranging bison herds in North America, has moved between Chihuahua, Mexico, and New Mexico, since at least the 1920s. The cross-border bison herd in the Chihuahuan Desert grasslands and scrublands demonstrates that the species can persist in desert landscapes”. Author William DeBuys had inspired me to look deeper into both the promise and the plight of the Janos Valley bison herd. While writing, I could hear the scratchy, obnoxious sound of cable news in the background. As I arose to turn off the TV, I heard that the U.S. Senate had reached a “compromise” on the 2013 Senate Immigration Bill. The compromise was one that only a group of isolated, Washington Beltway politicians could concoct. The new compromise includes seven hundred miles of impenetrable border fencing and twenty thousand new border patrol agents. If all of the proposed agents were to arrive at the border simultaneously, there would be one border patrol agent standing every 250 feet, all along its seven hundred mile length. Apparently, there is no federal money to protect grasslands and biodiversity along the U.S. Mexican Border. Instead, all the money will go to a vast “Maginot Line” of border defenses, to include fixed camera towers and mobile surveillance systems. This "standing army" would protect the U.S. against a feared “third wave of illegal aliens”. I can see the fence manufacturers, construction contractors and military equipment manufacturers salivating over their anticipated contracts. Who needs the hassle of foreign wars when we can have a fully militarized border right here at home? 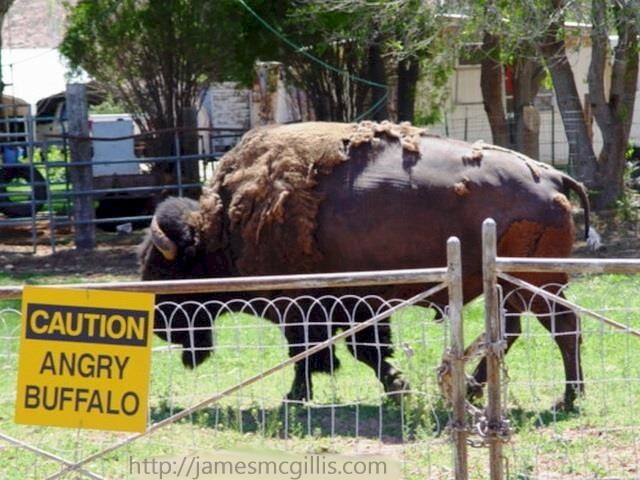 Soon enough, if conservatives win and conservationists lose, the Janos Valley bison herd will become a casualty of the 2013 Senate Immigration Bill. In order to live, the herd must travel north and south across the Chihuahuan Desert, including parts of Mexico and Southern New Mexico. While a cross-border consortium of governmental and non-governmental agencies works tirelessly to restore and enhance the desert environment, our federal government plans the largest environmental destruction project in U.S. history. If even a few of those Senators would visit the desert, they could foresee see the consequences of their actions. 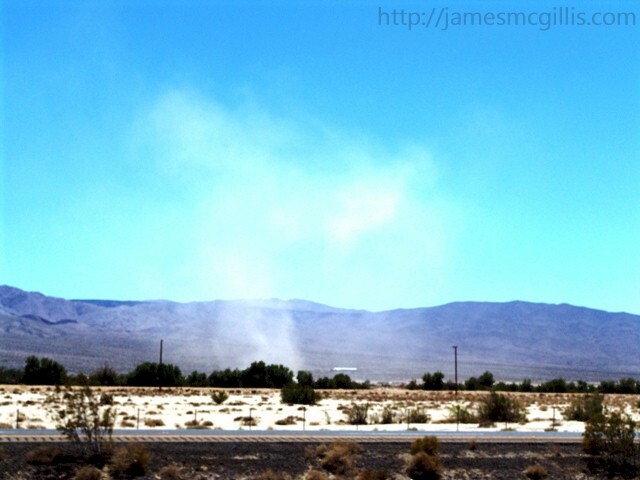 Desertification, including the encroachment of scrublands and the creation of dust bowls and sand-prairies is a problem facing most of the United States. Wall building and heavy vehicle traffic in our fragile deserts may indeed stop a few border crossings. In their zeal to “seal the border”, Congress may well destroy the desert bionetwork. 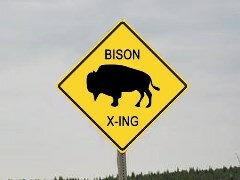 The unintended consequences of their actions may render the border area unlivable for humans, prairie dogs and the American Bison. The Mexican-American War ended in 1848. One hundred sixty-five years later is a poor time to spend $30 billion of our tax dollars to fight an ecological war against a fragile desert environment. Our Senate seems to say, “Give me a home where the buffalo roam, but at any cost, prevent ‘them’ from crossing the Mexican border”.